The cabinet that houses my older pots & pans reminds me of a Hollywood prison holding cell. I've got a Paris Hilton (shallow old saucepan), a Charlie Sheen (cracked pot) and a few Lohans (these are just scratched, stained and darn near used up). Ugh. Jokes falling flat today. Happily, the sad state of my older cookware opened the (cabinet) door for a new star to shine. My cast iron pan is my favorite. It's the well-aged Estevez to my cracked-out Sheen. It's never disappointed me. So I'm now the proud adoptive parent of two illegitimate mini cast-irons. What else can I do but embrace the situation and make adorable mini-frittatas? There are a few accepted ways to make frittatas. You can flip, bake or broil them after allowing the eggs to set partially on the stovetop. As I'm about as hapless as Henrietta Lowell, I prefer the ease of popping it under the broiler for a few minutes. Coat your oven-safe (illegitimate cast iron baby) pan(s) with plenty of butter, coconut oil, lard or ghee and saute your choice of veggies and meat (the “innards”) over medium to medium-high heat. While the innards cook, beat a few eggs (anywhere from 2 to 12 depending on the size of your pan), adding 1/2 tablespoon of cream for every 2-3 eggs. When the meat & veggies are cooked, pour the egg mix over them. 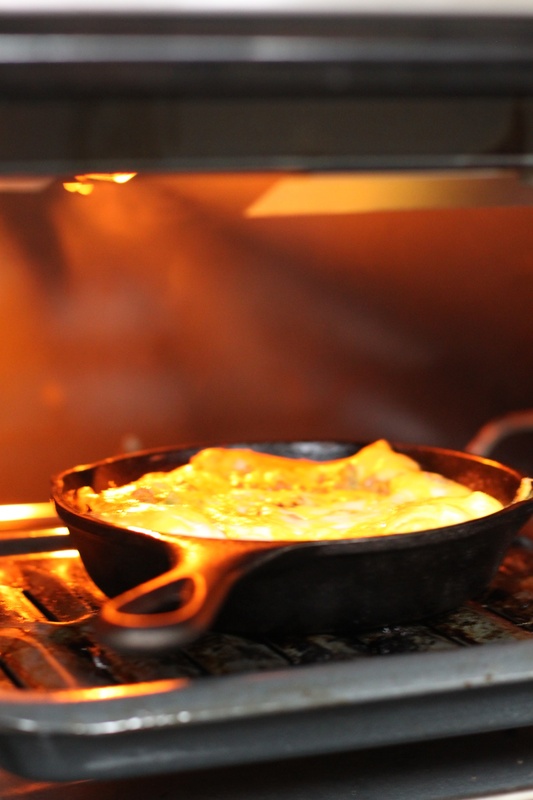 When most of the egg is set, but the top is still uncooked, pop the cast iron under the broiler to complete. It should only take a few minutes. Use a potholder. Use a potholder. Use a potholder. Otherwise…ow. Is this the broiler? Or is this heaven? And now, my obscure-movie-reference-loving friend, you've got a frittata. Serve with salsa & avocado on top, or make a fun eggish sandwich out of it. It's also delicious cold! 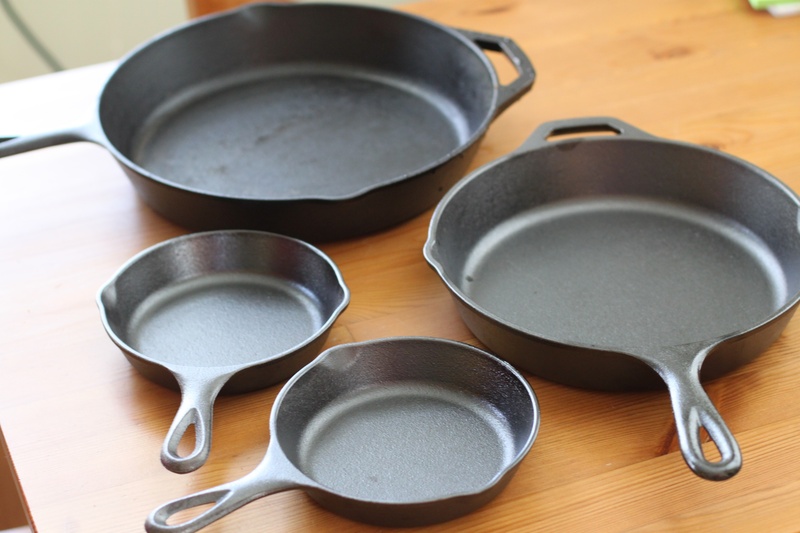 What kind of cast iron skillets do you like? Are they pre-seasoned? I keep bidding on vintage Griswold ones on ebay (because they are already seasoned), but so far, no luck with actually winning one. I’m trying to make the switch to cast iron, but am a little worried about whether my eggs will stick. Yours look fantastic!! I also covet the vintage Griswolds! But wedding gift certificates led me to Williams-Sonoma and the Lodge brand, which is pre-seasoned (although I find it’s still necessary to scrub and re-season). I have absolutely no problem with eggs, but the procedure has changed a bit from my nonstick days…I heat up lots of coconut oil, pour the eggs in (if scrambled) and allow them to set briefly over the oil. You really do need to use tons of oil. Then I just fold them over themselves as they cook, and they never seem to stick! I looooove my cast iron! My mother, who lives really really far away from me, has a large collection. I WANT them!! Do you want to know a really great place to pick up cast iron? Marshall’s. I go every few weeks and they have what they call “seconds”, but I cannot tell the difference and they work beautifully. As for sticking, I have only had my latest one for about 12 recipes, and if you just scrub with hot water after cooking and use fat when cooking, the seasoning really comes along. I also rub a little (teaspoon?) coconut oil on my pan after cleaning and either cook it in the oven at 350F for a half hour, or if I’m lazy I just throw it on the gas burner on low for a bit. I NEVER would have thought to look at Marshall’s! What an awesome tip! Your photos are mouth watering! I wish I weren’t allergic to eggs… I love the one of the pan in the oven. Cool pic! Hello. One of your family members referred me to your blog, and I look forward to getting better acquainted with it. Just signed up for updates. We have some health issues going on in our family right now (gluten intolerance; allergies to dairy) and are looking to learn more. Warren, thanks for reading. My “Smarter People” tab would probably be of great help to you.